Rating (134) 5 out of 5 stars. 134 ratings. Rating (64) 5 out of 5 stars. 64 ratings. Searching through all the available DJ options can be scary. You may not even know what you’re looking for. It’s called a DJ Mixer Board, right? Close, but they are more commonly referred to as DJ mixers. They are the primary tool of the DJ, just like what a guitar is to a guitarist. The DJ mixer is the DJ’s “axe” and American Musical Supply will help you find the right one for you! There are many styles of DJ mixer. When choosing one, decide how many channels you need. They typically have either 2 or 4 inputs. An input controls one separate source of audio, from a physical device (such as a turntable) or a virtual device (DJ software). You should ask yourself if you want to perform traditional back-and-forth mixes with two inputs or if you want to add even more voices on top of that. Each of these inputs has a channel strip. The strip consists of a gain knob, equalizer band controls, and a vertical fader for volume. The equalizer may be 2, 3, or 4 band, allowing for control of various levels of low, mid, and high frequencies. Some are rack-mountable whereas others are built for the tabletop. All DJ mixers have one common trait - the crossfader. It doesn’t matter if it’s a Pioneer or Numark mixer. The crossfader allows DJs to seamlessly mix, blend, or cut two or more sources of music. The crossfader is horizontal. Hear both channels when the fader is in the middle. Raise the channel's vertical fader to turn up the volume. Regardless of the brand, all analog mixers accept analog audio sources. DJ Turntables, DJ CD players/digital media players, or computers can be used with DJ mixers. Some are built for blending complex mixes whereas others are built for battling. 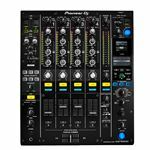 When mentioning the industry standard, Pioneer DJ Mixers are definitely in the conversation. Most of them are hybrid analog/digital DJ mixers. You can play vinyl or control Serato DJ software via their tactile interfaces. Trigger samples, cue points, and much more using Pioneer DJ mixers. American Musical Supply carries entry-level Numark DJ mixers. Their M series employ a club-style design and some have USB connectivity. Numark has been in the DJ game for many years and is a highly respected brand. 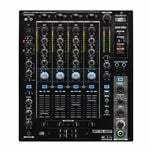 Behringer DJ Mixers have become increasingly more popular due to their feature set and price point. They employ multiple channels and many have USB connectivity. They are available in a variety of physical formats. In today’s day and age, more and more people are DJing with only a computer. You can easily DJ using software such as Serato DJ and Native Instruments Traktor. Look at one of our Virtual DJ mixers, or DJ Controllers, as we like to call them. DJ Controllers give you hands-on tactical control of two or more virtual decks. 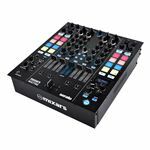 These all-in-one units also have a built in DJ mixer with effects and faders. We remind you to always look at the input and output connections. DJ mixers that are more professional will typically have XLR outputs. Regardless of which DJ mixer you choose, make sure you have the correct Audio Cables as well as quality DJ Headphones.